Portside Christian College is well on its way to becoming a digital school, but it wasn’t always this way. A new principal was appointed in 2015, and in 2016, Paul Connelly was employed as head of eLearning and charged with an explicit brief: develop a strategic vision for Portside as a digital school and implement it. Mr Connelly says there had been an ad-hoc approach to technology in the school, but change was nigh. 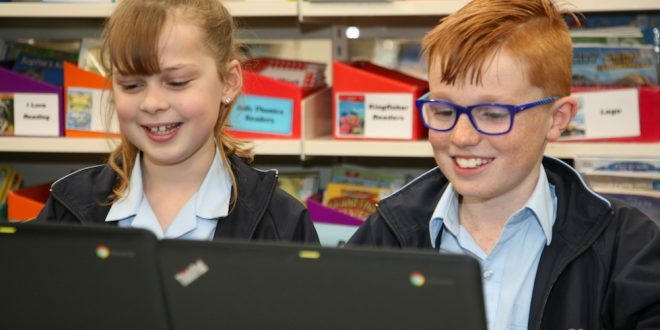 With funding from the Digital Education Revolution, previous management had rolled out a years seven to 12 one to one laptop scheme, which was working, but had some gaping holes, the most obvious of which was that primary students had little access to technology. Step one was to evaluate the wide scope of digital technologies and identify appropriate devices for each age group – the result was a “four-device mix”. Years one to three have iPads, years four to six have Chromebooks, years seven to nine have Windows laptops, and years ten to 12 have a BYOD option. This way students have ample opportunity to try different operating systems and platforms. “We can’t predict what will be the predominate operating system or platform in the future, so we want students to be nimble with digital technology,” he noted. 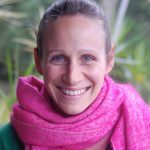 In fact, nimbleness is at the core of their vision for a digital Portside, which reads: Portside students and teachers confidently, safely, and nimbly use digital technology to deepen their understanding of the world and themselves. Students pick up their print jobs with a swipe of their cards. Mr Connelly says Mr Maxwell did this by centralising their printing system, by deploying a system called ‘follow me’ printing where staff and students can initiate a print job from any device. The print job is then sent to a central print server, which communicates with every printer around the school. The individual then accesses any machine that is convenient, swipes their card, and selects their own job to print. He says this has delivered two main benefits; accountability and connectivity to the Cloud. The reduction in “unregulated” printing has been considerable. 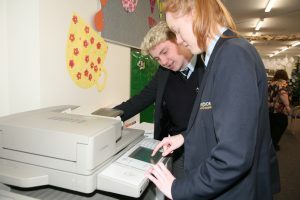 When students log on to computers and impatiently press print 20 times, saying ‘it’s not printing!’, the Canon system “provides a bit of capture”. The user then swipes their card, sees 20 jobs lined up, realises, and deletes 19 of them. Their next digital leap is one of connectivity and collaboration, and their centralised printing set up is ideal. “We have now become a ‘G Suite for Education’ school,” Mr Connelly explained. G Suite is an integrated communication and collaboration solution which involves uploading their operations to the Google Cloud. Portside’s teaching staff has embraced their digital journey. “Through Canon’s tech, we can hook into Cloud print, so users shoot print jobs through to our printing server via Google print.” This is particularly useful for iPads that don’t have regular printing drivers. Portside needed industry expertise to achieve their digital vision and printing and scanning workflow was smartly transported to the 21st century. Next on the team’s agenda is the “critical area” of the school’s 40-year student record backlog. Canon and Mr Connelly are putting their heads together on a digital storage solution that promises to be secure and simple. Mr Connelly acknowledged that any major change has challenges, but the school community has been largely positive. 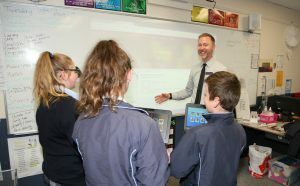 The college’s mission statement is ‘equipping students for life’, and Mr Connelly says everyone appreciates that working with digital tech platforms is doing just that, and they have enjoyed the extra engagement in their children’s learning through Google Classroom. “Parents have legitimate concerns about cyber safety,” Mr Connelly noted, but says they understand that deploying tech is a way to teach students to manage online challenges. How are the teachers coping? He says there’s a strong cohort of really excited teachers to champion the new technology, and their successes are galvanising the more nervous teachers. The next stage is to support staff as they undergo the pedagogical shift into digital schooling, with a plan to arrange personal devices for teachers. 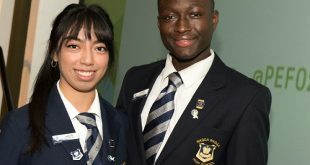 Portside is powering ahead with participation in the NAPLAN Online trials: “It’s important for us that our parents see we are on the front foot with these things.” With their motto at the fore, and a bit of help from their friends, they are well on their way to ‘equipping students for life’.